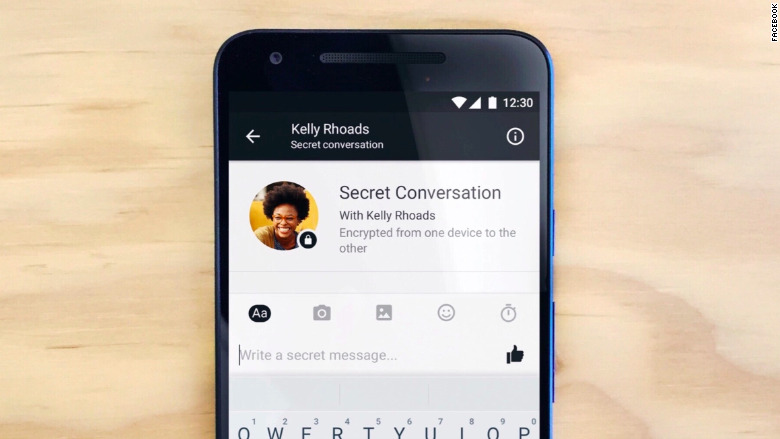 Facebook has finished rolling out a "Secret Conversations" feature in its Messenger app. The new mode ensures only the two people involved in a chat can see the text. In fact, even the government or Facebook (FB) itself won't have access to conversations in secret mode, according to the social network. The social network's 1 billion Messenger users now have access to the feature, CNNMoney confirmed. It uses end-to-end encryption, similar to what's found in Facebook-owned WhatsApp, Viber, Line and Google (GOOGL)'s new messaging app Allo. Messages will only be sent to whatever device used to start or first respond to the conversation. This means if you're chatting in secret mode on a specific smartphone, you won't see previous messages on your desktop. Facebook also gives people the option to let specific messages within Secret Conversations expire after five seconds or up to a day -- a feature not unlike what's offered on Snapchat. Secret Conversations have a black background instead of blue. The feature can be turned on when starting a new message within Messenger. You'll need to make sure you install the latest version of the iOS and Android app to get it. Messages will only be kept secret if both users have the updated versions. "We've heard from you that there are times when you want additional safeguards -- perhaps when discussing private information like an illness or a health issue with trusted friends and family, or sending financial information to an accountant," the company said earlier this year. Although the public fight between Apple and the FBI over encryption may be over, it continues to impact the way tech companies prioritize users' data security. As a result, more feuds between law enforcement and Silicon Valley firms may arise in the future -- similar to the recent controversy over accessing WhatsApp's data in a criminal case in Brazil.